A joint Toyota/Subaru sports car project has been in the works for what feels like forever. 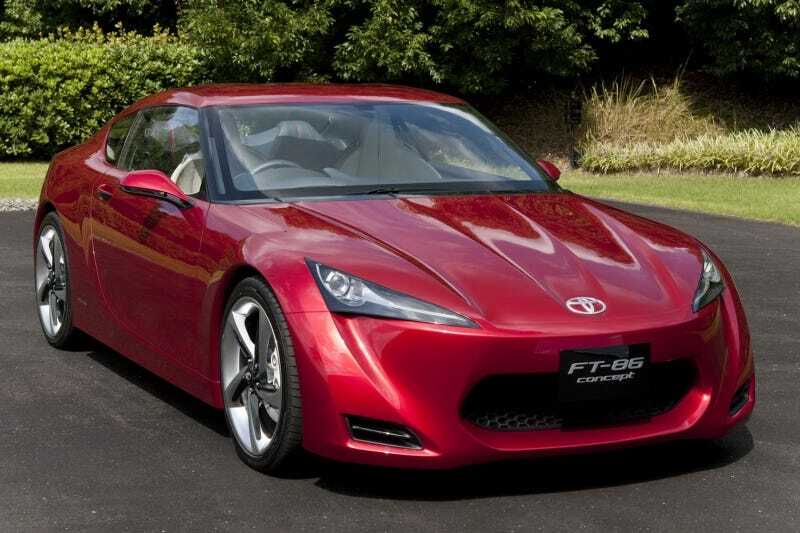 Now, finally, here's the first look, a heavily production-based concept called the Toyota FT-86 set to debut this month at the Tokyo Motor Show. The Toyota FT-86 concept is the fruit of cooperation between Toyota Motor Company and Subaru, and as such will wear a common chassis and some degree of engine commonality, at the least a 2.0 liter, four cylinder boxer engine dubbed the "C-45 Boxer" and making between 200 and 250 HP will power the rear wheels through a manual six speed transmission, and get this — no hybrid system. Saints be praised. Perhaps most telling are the car's overall dimensions. At 163.7 inches long, 69.3 inches, a wheelbase of 101.2 inches, and 49.6 inches high, it's thankfully compact, smaller in length, width and height than the Nissan 370Z, and slightly longer in wheelbase. It's also the first car to wear Toyota's new swoopy styling with some gusto. Dare we say it, we actually like the look of it. It's... exciting, we're so confused here. The interior is obviously all show-car glam and may serve as direction, but we'll be shocked if there are many zippers on the production car's dash. We're men enough to admit that combined with the recently unveiled 2010 Toyota 4Runner, we're about to shed a tear over what looks to be the return of the old, fun AE86 sports coupe-building Toyota.